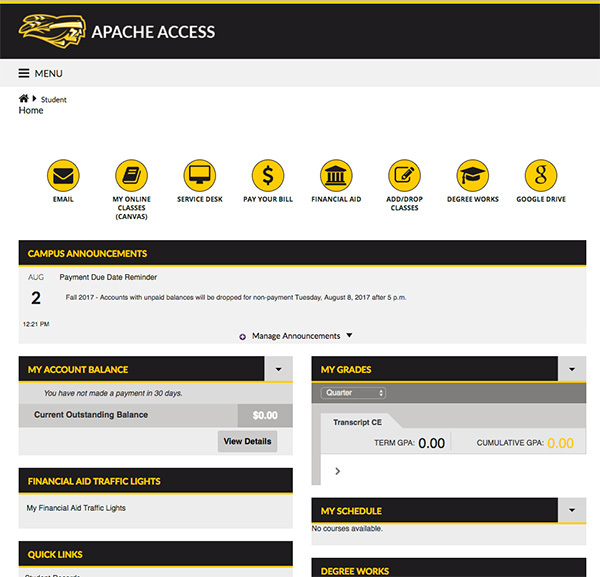 Apache Access is the student, faculty and staff portal for TJC. In Apache Access, you can view your grades, register for classes, view your student email, pay your tuition, apply for housing and scholarships and a ton of other things. Think of it as a collection of tools for your academic and work success at TJC. Login Issues? Clear your cache! Some users may experience problems logging into the Apache Access for the first time, or from a new computer. Usually, this problem is fixed by clearing your browser's cache. Safari (Desktop Browsers) There is a known issue with Safari, which requests a "certificate" from the user. Avoid using Safari on a Mac to log into Apache Access. Your Apache Access username is your student A-Number, which will look like A00123456. Your initial password will be the letters “TJC” followed by your birthdate in MMDDYY format. For example, if your birthday is July 22, 1998, your new Apache Access password will be TJC072298. To initialize your Microsoft 365 account, go to TJC.edu/office365 (you'll need your student email address, which you can find in Apache Access). If additional assistance is needed please contact the IT Service Desk via a Service Now Incident Ticket or by phone at 903-510-3269.